"~ Solving mysteries after-school! ~"
Seventh-grader Sheryl Holmes loves mysteries, and she’s decided to start a new club after-school dedicated to solving mysteries. Dragging her friend, James, into the club, the After-School Detectives help their classmates solve their problems and their mysteries. After-School Detectives has not been tagged yet. Help others find After-School Detectives by tagging it! 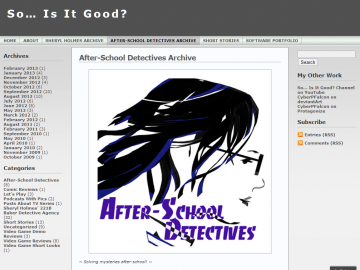 After-School Detectives has not been reviewed yet. After-School Detectives has not been recommended yet.